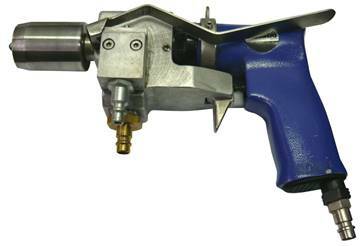 The manual vent cutter is designed for cutting and extracting vents from poultry carcasses. The manual vent cutter is made of stainless, acid-resistant materials. and in its lower part, a vacuum piston is mounted, whose reciprocating movement is synchronised with the actuating button of the drive unit. The vent cutter can be equipped with one blade with diameter D = 22, 25, 31 or 36 mm (according to customer’s request). Pressing the release button in the handle activates the vent cutter, by causing rotation of the blade and supplying vacuum to the collector. By inserting the mandrel and blade centrally into the vent, it is cut and sucked into the cutter (by means of the negative pressure), which allows for extracting it from the carcass along with a fragment of the intestine. Releasing the button stops the blade and cuts off vacuum. Subsequent pressing of the water valve lever supplies water into the collector, which pushes the extracted vent and removes impurities from the blade and the centring mandrel.